As we approach the waiver trade deadline, it’s becoming increasingly more unlikely that the Dodgers add any sort of notable reliever to their struggling bullpen. Waivers make it tricky to find a guy that would be worth adding to the bullpen, and the most optimistic relief option — Kelvin Herrera — destroyed his foot yesterday. Any bullpen reinforcements will likely have to come from within the organization. Julio Urias will be called up in September. Josh Fields, John Axford and Tony Cingrani could return healthy and solidify the bullpen. Kenley Jansen could stop giving up home runs. Without a doubt, the Dodger bullpen has been a tire fire in August. With four games remaining in the month, they have the fourth-worst bullpen ERA in the Majors (5.06, still somehow more than two runs better than Baltimore). FIP likes the Dodger bullpen slightly more, as their 4.53 FIP is tied for only the 10th-worst mark in baseball. If there’s any positive to take away, the Dodger pen has the third-best SIERA (3.17, only behind the Padres and Astros) in baseball this month. But even I, mediocrely paid card-carrying Dodger shill, will not attempt to tell you that actually the bullpen is good right now. I believe Weisman tweeted this after Jansen blew the save on Saturday against the Padres. Sunday was a better day for the bullpen, as they were gifted a five-run lead and only allowed four hits and one run in 3 1/3 innings, and Hyun-Jin Ryu picked up the seventh win for a Dodger starter this month. Dylan Floro has been pretty solid, and Kenta Maeda has looked good so far out of the bullpen. Everyone else is either hurt or struggling. If the Dodgers can’t trust Jansen, the whole situation gets a bit murkier. Luckily, on Saturday the rosters will expand and the Dodgers will be able to call up some reinforcements. Yesterday, they also made a minor-league signing that could factor in September. 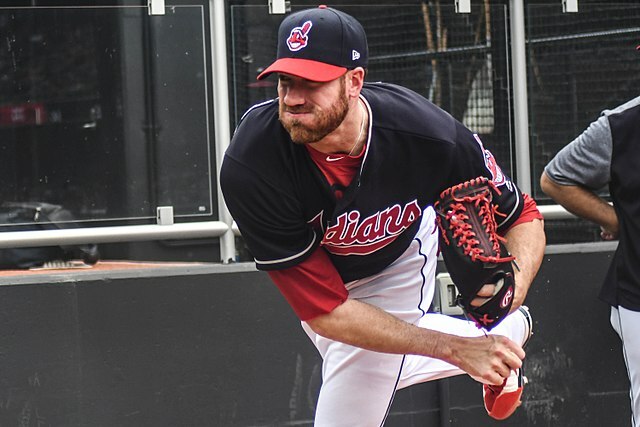 The #Dodgers have signed veteran right-handed reliever Zach McAllister to a minor league deal and he has been added to the @okc_dodgers roster. McAllister was a mainstay of the Indians’ bullpen the last few seasons and put up some pretty good numbers. 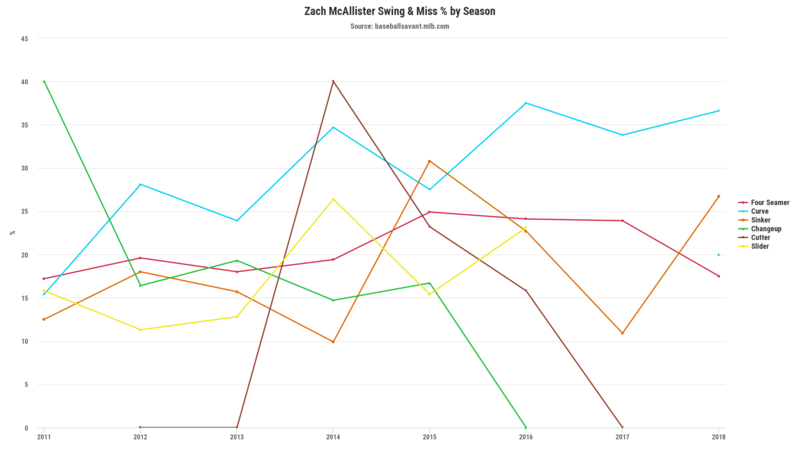 Zach McAllister was indeed a mainstay of the Cleveland bullpen for a few years. McAllister was OK as a full-time starter for the first three years of his career, but transitioned to the bullpen where he was really good for a few years. From 2015-17, McAllister appeared in at least 50 games each season and posted a 2.99 ERA/3.60 FIP in 183 1/3 innings (he did make three starts in this time). Cleveland released him earlier this year as he posted a 4.97 ERA/4.50 FIP in 41 2/3 innings for them. He latched on with the Tigers and posted an impressive 21.60 ERA in 3 1/3 innings before they cut him loose. Doesn’t exactly sound like the savior for the Dodger bullpen. That said, McAllister has been victimized by three really bad outings. In 2 1/3 innings spread out over those games, McAllister allowed 14 hits and 12 runs. He’s had three other two-run outings and 12 outings where he’s allowed one run, giving him 22 scoreless outings. He’s also inherited 18 runners, six of whom have scored. Most of his peripherals are in line with his career norms, and nothing really sticks out too hard from his three good years in Cleveland. If anything, he should be slightly better than he was from 2015-2017. That swing-and-miss chart is wild, but just focus on the last three points of each pitch, when he became a reliever full-time. The only real downgrade on any of these charts is the swing-and-miss rate on his four-seam fastball. 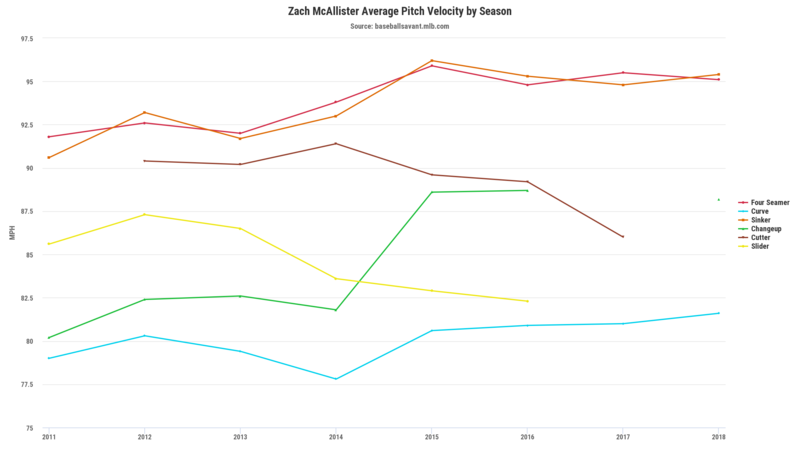 McAllister is throwing that fastball roughly three percent less frequently than he did last season (63.9 percent compared to 67.1 percent), and the average velocity is 0.4 MPH slower, which isn’t really enough to completely tank the value of the pitch. However, batters are whiffing on it only 17.5 percent of the time after whiffing 23.9 percent of the time last season. 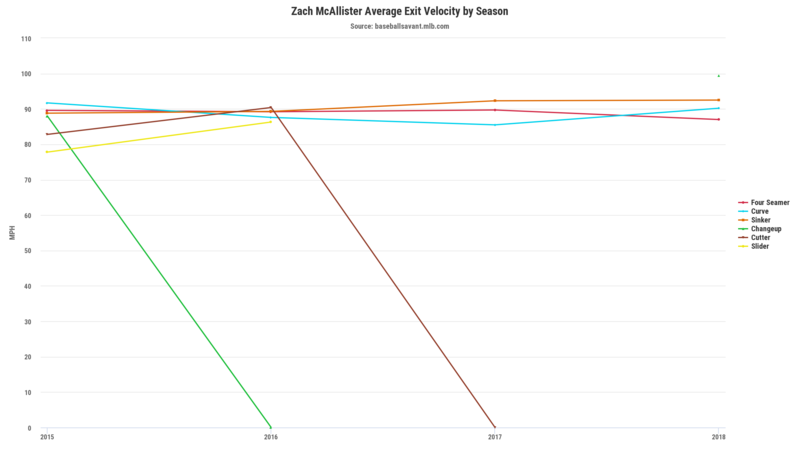 McAllister’s 2018 fastball features a higher spin rate than last year, and batters are hitting it with a softer average exit velocity (87 MPH this year, 89.7 MPH last year). The average launch angles aren’t super different either (15 degrees this year, 14 degrees last year). However, last year batters posted a .247 average and .383 slugging percentage against his fastball. This year? .306 average, .532 slugging. His fly ball profile fits well in Dodger Stadium. His walk rate leaves a little to be desired (3.0 BB/9). Also, his .346 BABIP could normalize and lead to more success going forward — especially since his exit velocity numbers are encouraging. 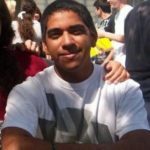 Since Dustin’s post, both of those first two statements still hold true. McAllister increased his fly ball rate from 35.8 percent in 2015 to 42.8 percent in 2016 and 2017, but it came back down to 37.5 percent this season. McAllister has some awfully pleasing stats. For his career, his ground ball and fly ball rates are each 39.5 percent. Also to please my OCD, McAllister’s BB/9’s since 2015: 3.0 in 2015, 4.0 in 2016, 3.0 in 2017, 2.0 in 2018. His BABIP normalized to .296 last season, but shot back up to .355 this season. He’s allowing more hits per 9 innings than he ever has as a reliever, and his highest since his first Major League season, but it’s hard to see much to indicate he’s deserved that outcome. McAllister has had a really bad year, and the Dodger bullpen has had a really bad month. In that way, it’s a perfect fit. However, this front office has never been the kind to add a player for shits and giggles. When they see something they like in a player, they try to bring it out. I’m sure they don’t think McAllister is as bad as his numbers dictate. Or maybe they wanted some minor league depth to lead the Oklahoma City Dodgers to the PCL title. Who knows? But it wouldn’t shock me to see him get a look at the Major League level in September, and it wouldn’t shock me to see him have some success, at least more success than he’s had so far this year. Trust me, it’s not like the last time I wrote about a Dodger reliever he gave up seven runs in his next three outings.